Note: place cursor on red asterisks for footnotes. Following on from the discussion of how the various forms of My father's a hedger and ditcher came about (Enthusiasms 79) and, similarly, how Bonny Light Horseman acquired a Napoleonic tint (MT article 195), it seemed worthwhile giving another example of change of emphasis in text and context via The Ratcatcher's Daughter. having every polka with a coloured frontispiece that ever was published; from the original one, where a smooth male or female Pole of high rank are coming at the observer, with their arms akimbo, to the 'Ratcatcher's Daughter'. It had obviously moved onto song-sheets and had become established. In support of the details given above, there is a well-known cover for the published piece as song that dates from the 1840s; and a copy of a poster in the East London Theatre Archives online advertising a crammed performance including The Ratcatcher's Daughter that took place in 1855. 7 General opinion suggests that the heyday of live exposure for the piece was in the 1850s. Some contemporary and further fortunes of the piece are recorded below. Perhaps, too, Bradley's assertion (as recorded above) is an admittance that he had nothing to do with composing The Ratcatcher's Daughter. Cowell, though English-born, had spent his early life in America and did not return to England until 1840 so this 'fits' the comments given above; and as his memorandum indicates, he was much associated with the song during the 1850s (he was also noted for singing Villikins and his Dinah and Billy Barlow). Cowell returned to America in 1860, but suffered declining health which persisted on his return to England in 1862, forcing him to retire from the stage. 10 Whatever the nature of Sam Cowell's considerable involvement, he was no more responsible for any original text than was Bradley. But broadside history helps us to focus on how The Ratcatcher's Daughter developed from a relatively straightforward narrative into a performance-related piece as part of an entertainment characteristic of nineteenth century theatre (the Astley's syndrome as discussed in previous MT pieces), eventually coalescing as music-hall. Misfortunately, there is no corroborating sign of it as a performance piece in those newspapers available to this writer. This may well reflect its character as being unacceptable to the fashionable palate at the time; but commentators, as already seen, attest to its popularity in a wider social context. There are then three small points to be made. It should be noted that the broadside title appeared as The Ratcatcher's Daughter, The Rat-catcher's daughter and Rat Catcher's Daughter. It should be borne in mind, too, that we are reliant on broadside copy that has emerged and that it may just be that there is more. There is also opportunity here to correct an earlier suggestion about the paucity of broadside copy, given in MT article 144 on Devon printers and including the name of Wilson of Bideford as being connected to the Ratcatcher's Daughter (see more below). As for the Catnach text itself, some characteristics stand out. Catnach issue of the ballad in question - as found in the Bodleian archive - was in one long column as if it was a slip song. Text was in standard English: what one might tentatively take to be the original broadside form. The narrative ended after seven stanzas with the death of an eager sand-seller and his romantic target, a ratcatcher's daughter. Bebbington in Manchester (the Bodleian gives ballad-printing dates of 1855-1861) printed copy that was also sold by a John Beaumont, distributor of ballads who, according to copy, was working out of 176 York Street, Leeds. At the time of issue of the ballad, Bebbington was working from Goulder Street, his address on copy. Between 1858 and 1861 he had moved to Oldham Street. 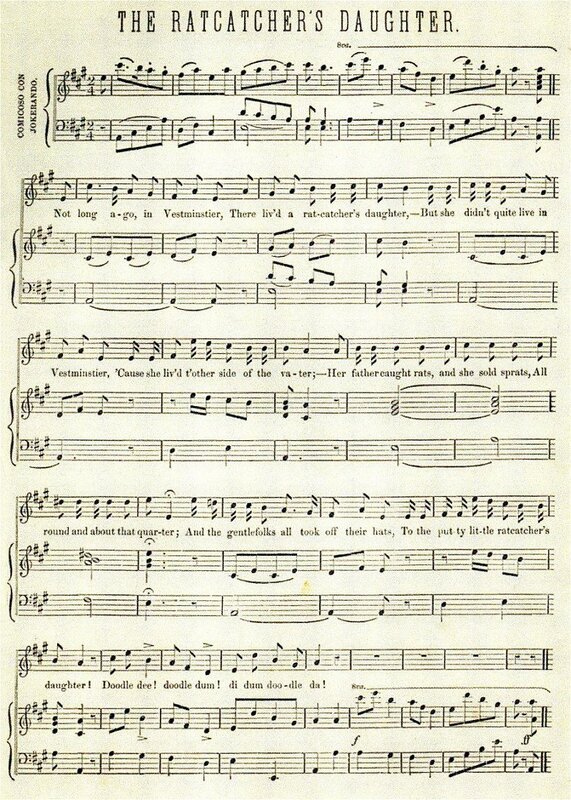 The Bodleian, accordingly, dates copy of the ballad from between 1855 and 1858. Other named copy, as noted below and in a changed form, came from Wilson in Bideford and from Harkness who, as will be seen, may well have acted as a catalyst for the progress of the piece. All told, working within and around a time suggested by the dates of these printers shows that whilst genesis was at a relatively early time, even if a first date is still unclear, the bulk of exposure threaded through the middle and second half of the nineteenth century. Was the pretty Ratcatcher's daughter. But he, confused in his search for romance, instead of crying his wares - 'lilly white sand' - called for the ratcatcher's daughter. In respect of development, there is an adoption of a kind of slang: the use of a 'w' instead of a 'v', for instance (see, as an example, Werry Pekooliar); 19 and the presence of the 'h' in the 'wrong' place or its omission altogether, also both characteristic of the trend. Derek Scott has a deal to say about how this may have been intended to represent 'Cockney' speech, known sometimes as 'Mockney'. 20 Sam Weller comes to mind as a character who used this form of English in Pickwick Papers, which came out in 1837. Magwich, in Great Expectations, asks Pip 'Do you know what wittles is?' though not until 1860-1861 when this novel was first issued. It may be that there was a prolonged flirting with 'Mockney' in literature - and the music-hall. Dickens certainly set Great Expectations back in time during the early and middle part of the nineteenth century (for fictional purposes much as Hardy set novels back in time). Should be dead as any herre-in. They brought in the ratcatcher's daughter. That she vouldn't be alive on the Sunday. [SPOKEN.] - And considering the state of the Thames at this here present moment, vhat must she have swallowed! urgh! urgh! Doodle dee, &c.
The textual developments in The Ratcatcher's Daughter give an exaggerated - even gratuitous - character to the piece compared with that in any first issue under named printers and it does seem that this is indicative of a context beyond the bounds of printed balladry where entertainment, sometimes riotous, was a moving force. For present purposes it is enough to note that the chorus lines, in particular, would suggest a degree of regular performance and, adumbrated though they sometimes are, such lines must have relied on the assumption that any audience would be able to supply a full familiar chorus. The spoken element, too, must surely betoken performance of one kind or another. In all this, it is worth looking at the Harkness contribution more closely. There are four Harkness copies in the Bodleian archive. Two of these are numbered '805'. Harkness was apparently meticulous in numbering his extensive copy and The Ratcatcher's Daughter appears at about the halfway point in his output. Since Harkness began his ballad-printing somewhere around the 1840 mark - perhaps a little before - and finished at around 1866, a potential date for the appearance of the ballad under his aegis can be abstracted. In fact, Gregg Butler points out that the number on Harkness copy before '805' is dated to an event on 19th February 1857 and that the number '887' appears on other copy dated to an event on 14th January 1861. Both '805' copies are in conventional English. Both have seven stanzas. Both indicate chorus lines that repeat the final line of each stanza. This might well suggest that they were issued at a relatively early date - the ballad being still in the process of alteration - and likely to have coincided with Cowell's intervention. text, credited to Harkess, and with the number '805' on it. Much of the text is blacked out but there is enough to indicate that there are seven stanzas, that the final words of each stanza are repeated as a chorus and that text is in conventional English. Interestingly in terms of a printer's profile, there is no address on any Harkness copy and, together with his presentation of the different forms of the ballad, this would ultimately suggest a printer wholly confident of his place, at least within his geographical hinterland. The distribution of copy elsewhere than the Preston hinterland indicates a degree of his expansion and influence: another mark of confidence - but, ultimately, another story. To bring the Harkness saga to a head: since he worked within and around the time period of most of the named printers noted above bar Catnach and since he put out both the 'conventional' version and the one that extends it, he is clearly important in terms of the new direction of printed copy before - even as - it was taken up as a sung piece. Taking into account the growth of the piece as it incorporated Sloman's contribution, it would be expected that this is the version that came to have a prominent life in performance; and this is confirmed in least one Sam Cowell version - online (and below) - that contains the Sloman input. The version provides text and tune together inclusive of the two Sloman stanzas and a chorus line beginning with 'Doodle...' that is replicated elsewhere with one or two slight changes depending on context. There is no evidence, though, that Cowell incorporated sections of speech. There was also a steady accumulation of printings in songsters. Marshall in Newcastle would seem to have been one of the earliest printers in this form in his New Theatrical Songster - Marshall's dates are given as 1810-1828. There seems then to have been a kind of jump over years until the version from The Poet's Box in Glasgow that dates from 1858. This is followed by Beadle and Co.'s Dime Song Book No. 5 (1860) in New York; in the Great Comic Volume of Songs - with music (c. 1863); in The Comic Songster (1870); in Comic Songs Sung by Sam Cowell - with music (c.1878); in Cole's Funniest Song Book in the World (1890). One might also mention another American version, published by S T Gordon on Broadway in 1900 (online - my italics), further prolonging the life of the song. It can thus be assumed that song versions, found in the music-hall and in a widening published guise, were principal agents in encouraging further popularity. Then, too, if the Keys post-1870 textual input is taken as a measure of continuing interest, the ballad can be seen to have infiltrated comparatively modern times. That this was so is proved by the re-surfacing of the piece in notations made by Vaughan Williams and George Butterworth during a visit to Norfolk in 1911. During their short visit (19th-21st December) to the Diss and Tibenham areas the two came across half a dozen singers, one of whom was William Tufts senior, born in 1828 and so providing a long, notional learning period that includes the continuing issue and performance of The Ratcatcher's Daughter. The surname was well-known, sometimes as 'Tuffs - which is how Vaughan Williams put it on manuscript copy. No words were taken down but comparisons may be made with the tune Mr Tufts used and that from Sam Cowell. The tune from Mr Tufts, as found in the Vaughan Williams and Butterworth manuscripts, offers an eight-bar phrase that is then repeated. This accommodates the first half of any eight-line section of the song and the repeat of the phrases would take in the full stanza; but there is a caveat. The notation is not the same as that from Sam Cowell. In fact, Mr Tufts only sang the second half of Sam Cowell's tune - without benefit of a sharp note at the point indicated in notation given above. There can be no doubt about the correspondence of the chorus lines. In the Tufts version, as shown, the second eight-bar sequence fits a chorus line that would contain the Doodle... jingle that is very much the same as that from Cowell except for the final notes. These, it has to be presumed, matched other syllables, most likely to have been '(di) - DO' in line with each of the broadside copies without imprint - '252' - that carry the chorus-line as 'Doodle dee, doodle dum, ri, dee, do, da, di do'. This might, in turn, suggest that Cowell's was not the sole sung version in circulation (variant text has already been noted) - but, mostly, one returns to Cowell as a principal agent. It might be surmised, as a result, that, after all the textual developments and music-hall exposure, Mr Tufts had encountered the ballad - the song - directly at a performance or, again, by oral dissemination: hardly a startling conclusion. But the chances are that the song was still being sung inside or outside music-hall when printed single ballad copy was fast disappearing. In sum, however it was arrived at and whatever its subsequent progress, it looks as if Mr Tufts gave Vaughan Williams a stage version, of Ratcatcher's Daughter but that it is not quite the version perpetuated by Sam Cowell. It nonetheless offers a glimpse of under-currents and certainly promoted the continuing life of the ballad into the twentieth century. 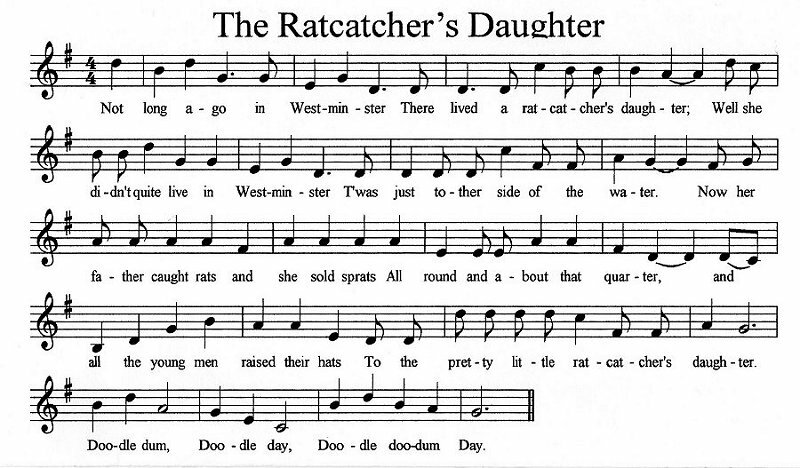 Mr Menteith also refers to a tune that certainly has echoes of the Ratcatcher's Daughter - may even have derived from it - from the fiddler Thomas Hampton (baptised 1844, died 1896). His probable source was T Westrop's 120 Country Dance Tunes (though dating of the latter is difficult). 34 This at least gives us a coincidence of evidence for the last part of the nineteenth century. There are no claims here of a full, constant exposure of the piece down through the years. The more important process, if not quite in the mode of either My father's a hedger and ditcher or Bonny Light Horseman, is that of the change of character in the ballad and context for its lifetime. 1. The usual thanks go out to the Bodleian and Cambridge university libraries for permission to make use of their respective stocks of ballads and to VWML for supply of material. Alex Burton, at VWML, has been of particular help. I am also indebted to Gregg Butler for an enlightening dialogue centred on the printer, John Harkness. Gwilym Davies kindly put me in touch with Mr. Charles Menteith whose version of the song is discussed in this article. Alan Helsdon, in Norfolk, was able to offer details of the 1911 trip to Norfolk that Vaughan Williams and Butterworth made. As ever, Steve Roud's index is a principal source of reference. 2. The Canterbury Hall was opened in 1852 and remodelled in 1856. 3. No doubt this information can be got elsewhere but, in this instance, was found online in Deep Roots magazine, 2012. So far, no date has been found for 'Out of the Season'. 4. See online a Dictionary of Victorian London for several references to the Grecian Rooms, formerly the Eagle Tavern. 5. See Arthur Hayward: The Dickens Encyclopaedia, Vol. 8 (unpaginated - the reference to 1846 can be found under 'R' in a Routledge Library Edition, 2010. The book was first published in 1924). 6. See Derek Scott: Songs of the Metropolis, OUP 2008, p. 174. 7. Images of the cover are easily available online. The online poster advertised performances at the Pavilion Theatre. 8. James Hepburn's observations can be found in notes to the introduction in his book (p. 273) that appeared in 2000. 9. See online Notes and Queries, July-December 1876. 10. Villikins... was a burlesque version of William and Dinah, couched in 'urban slang' - 'Mockney' - and much elaborated by Sam Cowell. The song seems to have emerged at around 1853. Billy Barlow is a version of Hunting the Wren, not in 'Mockney' vein; and there is a multitude of similar narratives especially in America. 11. Roud Catnach copy is found in the Bodleian archive as Harding B 17(251b) and and copy issued with Bennet and Batchelar as Johnson Ballads 227 and 228 and Harding B 11(2328) - they look like successive issues. 12. For Pitts, see Madden Volume 76, Number 538 and for Taylor, Madden Volume 80, Number 1 (it is not clear which Taylor but Henry appears to have issued most ballads under the name - at a relatively late date in the 1840s and after). 13. Jackson (and son) copy is found in the Bodleian archive as Harding B 11(502). 15. Copy from Bebbington and Beaumont is found in the Bodleian archive as Harding B 11(2232). The only other detail of Beaumont's career is that in 1826, according to BBTI, he was printing out of '5, North Low, South market' Leeds, most probably only generally. Bebbington also used other distributors. Beaumont worked with T. Pearson after 1861, from the same Oldham Road address previously occupied by Bebbington. 17. The Dublin copy has no printer's name. John Moulden's thesis, The Printed Ballad in Ireland (Univ. of Galway 2006), covering the years 1760-1920, makes clear the generally late appearance of broadside ballads in Ireland. 19. Werry Pekooliar can be found in Pitts' 1836 list; in Collard's 1837 list (but not in his Madden collection); and in Beadle's Dime Book, No. 10 (1863). A sort of companion piece, Werry Mysterious, can be found in the London Vocalist (c. 1840). 20. Derek Scott: op cit, p. 174. 21. See n.i. 2806 c. 15(24) in the Bodleian archive. 22. The four copies that have the same standard format are found in the Bodleian archives as 2806 d. 31(83), Firth b. 34(253), Harding B 11 (3233) and Johnson Ballads 3320. Copy in one column is found, same source, as Harding B 11 (2526). Apropos the name of the printer, readers are, of course, invited to submit suggestions. 23. Copy is found in the Bodleian archive as 2806 b. 9(246). (1844), online, describes him as 'the clever extemporaneous singer' who was 'adding to his reputation by improvising a medley nightly at the Victoria'. A playbill for 1855 housed in the East London Theatre Archives cites Slowman as 'improvisatoire'. Other references have him composing songs for fellow artistes and for the audience. 25. All 'Sec 24' copies include these spoken passages. 26. There are three different forms of The Margate Hoy, one of which is from Dibdin and replicated, as example, in Oxlade copy as Madden Volume 89, Number 240..
27. These copies are found in the Bodleian archive as Harding B 11 (415) and Harding B 11 (416), the latter with 'Sec 24' on it. There is one slight query. Gregg Butler kindly sent a copy of a Harkness copy '804' - 'on the Dreadful COLLIERY EXPLOSION' but it, too, has the number 'Sec. 24' on it. Are we, then, talking about a number that signifies a batch of ballads? 28. Copy is found in the Bodleian archive as 2806 c. 13(120). 29. Copy is found in the Bodleian archive as Harding B 11(3234). 30. For Wilson see MT article 144. He can be seen as a printer with and extensive history and an equally extensive stock including currently popular ballads, mainly light in character; and a substantial number of semi-religious pieces. 31. Profile can be gleaned from online sources. All the songsters are recorded in Steve Roud's index and show, for one thing, how popular Cowell's songs became in America. A late bloom in printed form can be found in Johannsen's The House of Beadle and Adams 3, 1962, a re-issue of text. 32. William Tufts died on 6th February 1912. 33. Mr. Menteith previously used his version in his own way in the online magazine Folklife Quarterly.